Frozen is still HOT. The 2013 movie which made more than US$1.3 billion is now making Disney very happy with continued merchandising success. I should know; I have had at least three different sets of Anna and Elsa singing dolls driving me nuts at home. They were still flying off the shelves last Nov at the Disney store in San Francisco when I was there. So now we have Frozen Fever - the animated short released at movie theatres this spring. It's a new tale which centres on Elsa and Kristoff trying to conjure the ultimate birthday celebration for Anna. It's cute. 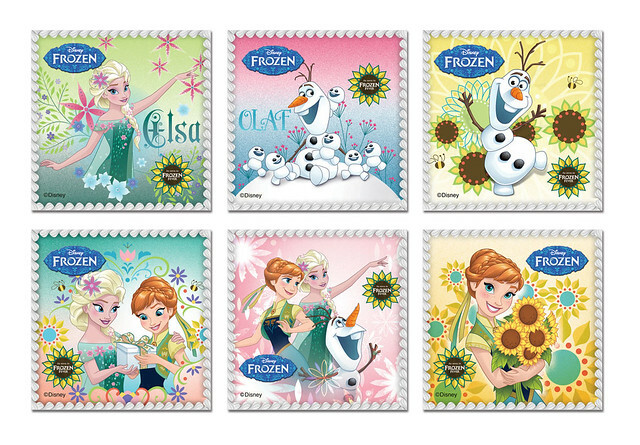 And along with Frozen Fever, BreadTalk is unveiling a limited edition "Frozen Fever" collection comprising whole cakes, frozen snow cones and frozen spring cones. You'll find these at all BreadTalk outlets from 20 March to 30 June 2015. I think these are going to be the default or most requested birthday cakes at children's parties. One creation, Olaf in Spring 雪宝爱春天 (S$45) features the snowman set on a light sponge filled and iced with luscious Chantilly cheese cream, fruits and white chocolate ganache. Covered with matcha sponge crumble, the cake resembles a green pasture dotted with pretty flower icing decoration. Pity Olaf's hair is not standing up straight. You can also opt for customised printed cakes available in two sizes; 2 kg and 5kg with two flavours to choose from – Chantilly and Chocolate. 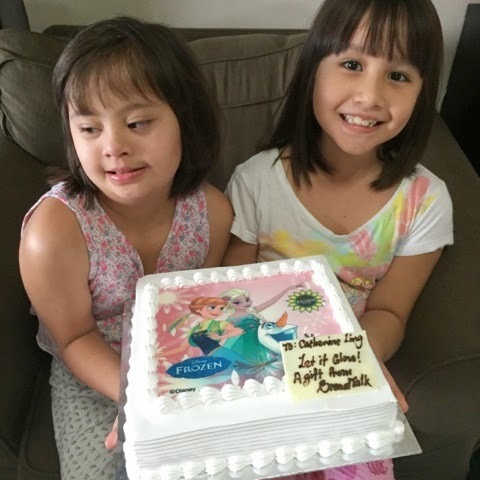 My kids have already seen the Frozen Fever animated short, so they thrilled to see the cake. Well, they would be thrilled to see anything Frozen regardless! There are six printed designs (above) to choose from. Frozen themed cakes are not new, but this one from BreadTalk does taste slightly better than the others I have tried. But what's more unusual are the Winter Snow Cones and Spring Cones. Aren't they adorable? BreadTalk’s snow cones (S$4.50 each) are made from almond sponge cake with a choice of different mousse centres. 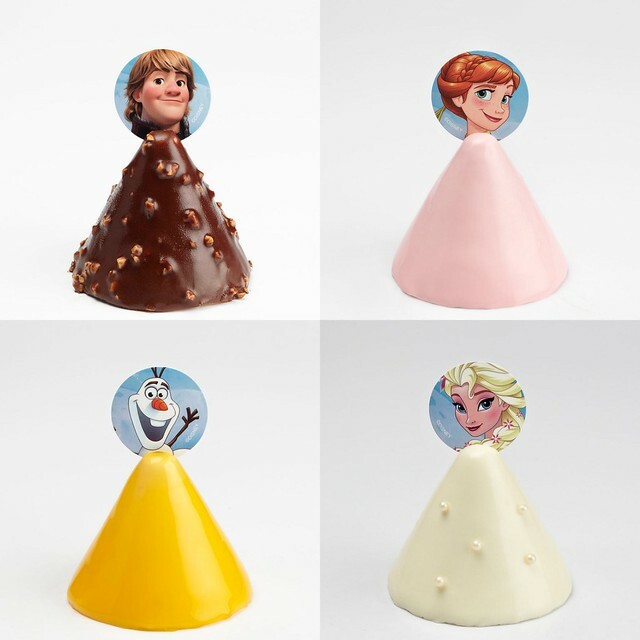 They are blanketed in a smooth glaze and topped with four character toppers; Elsa, Anna, Olaf and Kristoff, which double up as bookmarks! Elsa Coconut Cooler Snow Cone 凉爽椰子: sweet coconut mousse cloaked by a wintry-white glaze adorned with pearl glitter dragee. Anna Strawberrry Surprise Snow Cone 草莓惊喜: delicate strawberry mousse and covered with strawberry glaze. Kristoff Chocolate Fever Snow Cone 巧克力疯: coffee mascarpone mousse with a rich chocolate almond glaze. The sweet and savoury Spring Cones come with a soft and fluffy bread base. Go see them in the shops! The Cheese Sausage 芝士香肠 ($2.30) with an Elsa character topper is a chicken sausage sweet bun with melted cheese and sprinkled with seaweed, while Custard Raisin 葡萄卡式达 ($2.30) with an Anna character topper is a sweet rendition with a custard fresh cream and raisin filling covered in a strawberry chocolate glaze and silver dragees. For the chocolate lover, the Coconut Summer 夏天椰子 ($1.90) and Chocolate Fever 巧克力疯 ($1.90) with Olaf and Kristoff toppers offer buttery brioche breads glazed with white chocolate and dark chocolate respectively, and crowned with coconut and chopped almonds. • Receive a Spring Cone for FREE when customer purchase any 4 Frozen Snow Cones or Spring Cones in a single receipt. 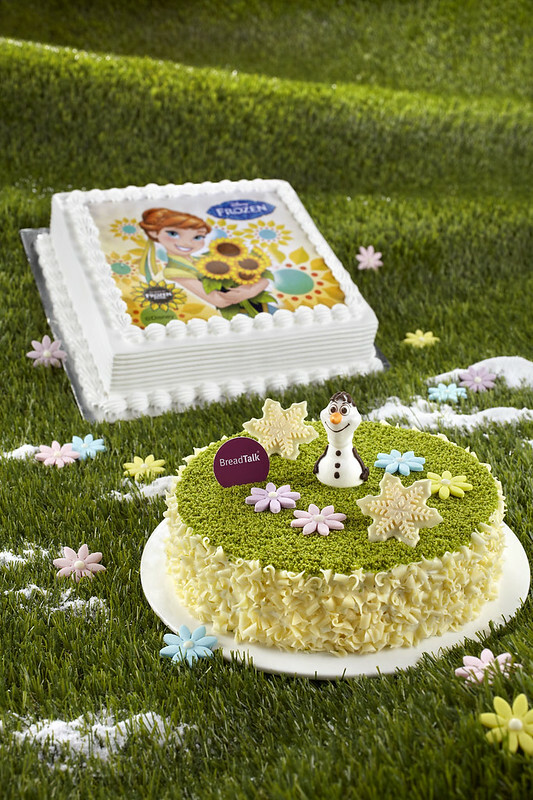 The ‘Frozen Fever’ themed cakes and breads are available at all BreadTalk outlets island-wide from 20 March to 30 June 2015. So you think Frozen might let it go after two years? Not a chance. Frozen 2 has just been announced. Many thanks to BreadTalk for the cake!